A Tax Clearance is an official document issued by the Bureau of Internal Revenue (BIR) in the Philippines. It is commonly requested by the taxpayers or businesses used as a verification to the investors or clients that the business is tax compliant or of good standing. This is also a required document to apply for government tenders or render particular services. If you need to get a Tax Clearance, it is important that you have kept the BIR documents of your business or company. It is also favorable if you don’t miss a tax payment before. Moreover, you must know the location of the Revenue District Office (RDO) in the locality where your company/business belongs and also the BIR Regional Office. Letter of Request for the enrollment in eFPS. Include 2 authorized users with the following details: name, email, contact numbers and position. You should not miss any tax payment before and bring the tax payment form and printed BIR acknowledgement email. Otherwise, you need to settle your taxes in the office and pay for penalty. Written request for tax clearance. Go to the RDO and bring a written request for tax clearance and other requirements/documents. The RDO will check if you have any delinquency or missed tax payment. If you have a payment delinquency, you will be asked to pay for it including a penalty fee. If everything is cleared, the RDO will give you the Certificate of No Tax Liability. Pay for the Tax Clearance Certification Fee worth ₱100 through eFPS. Then, attach the eFPS Bank Payment Confirmation Receipt. After the submission of all your documents, patiently wait for further instructions. If everything is cleared, you’ll be called to claim your Tax Clearance. In some areas, you’ll be asked to bring your documents to the BIR’s Head Office. The Tax Clearance is valid for 1 year. 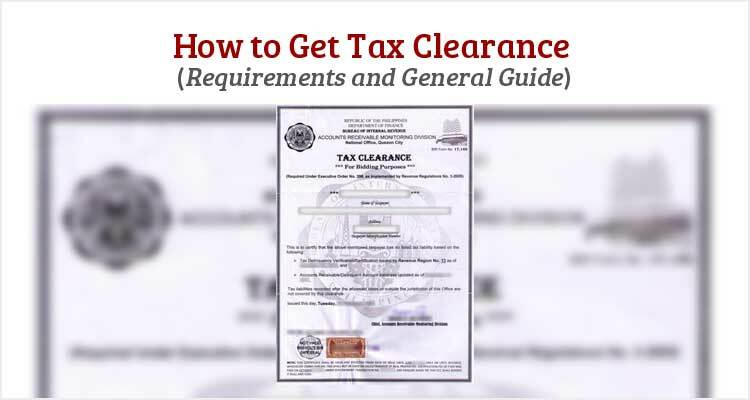 That was the general guide on How to Get Tax Clearance in the Philippines. If we miss to include some details, do let us know in the comment section.